No matter how much diners love lobster rolls, even this favorite summertime seafood sandwich can become predictable, and, well, tired after a while. To combat potential lobster roll fatigue, chefs are finding inventive ways to serve up the popular seafood during peak season. "At this point lobster rolls feel like a classic, and they are the perfect cooling antidote for our Nashville summer heat,” said Shawney Severns, chef de cuisine at Fin and Pearl in Nashville, Tenn. “A couple of times this season I've made one for our sandwich special and they continue to be very popular." But with the high price of lobster this season, the Fin and Pearl culinary team has turned to creative ways to make the seafood approachable and affordable for customers. 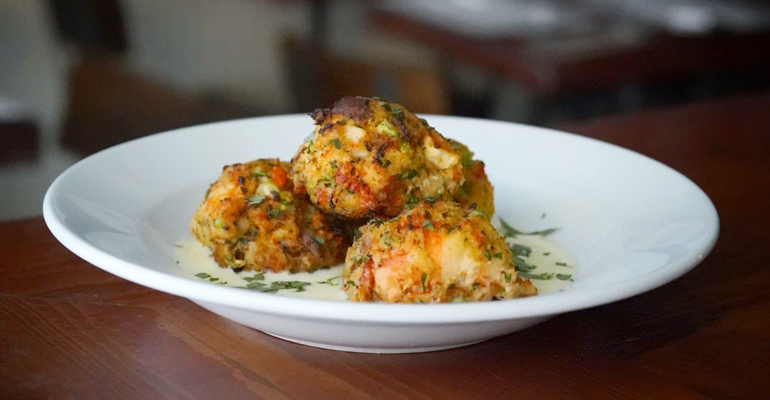 Among the restaurant’s well-received offerings are a butter-poached lobster and lump crab omelet offered for breakfast, and sides of shells and cheese or whipped potatoes that come with the option to add hot buttered lobster. Meanwhile, other chefs are taking the best of the lobster roll and transforming into a new format. At The Meatball Shop in New York, the lobster roll is morphed into a sphere in the chain’s Naked Lobster Balls. New England and Southern fare combine in a Lobster Pot Pie at Vue 1913, a brasserie-style seasonal restaurant at the Omni Grove Park Inn in Ashville, N.C. The mashup features a 1.5-pound lobster, brandied cream and vegetables in a giant pot with dough draped over the top. The whole pie is cut open tableside to allow steam to dramatically escape, and then the lobster is served. Squid ink Lobster Roll at King Tide Dish and Shell in Portland, Ore. 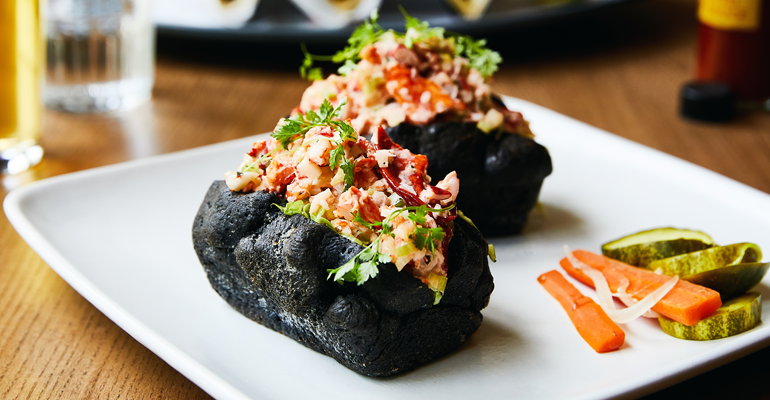 Chef Lauro Romero of King Tide Fish and Shell in Portland, Ore., gives a traditional Northwest-style lobster roll a subtle refresh with the addition of squid ink to the brioche roll. While the change is mainly for the striking color the ink gives the roll, Romero says it does add a subtle flavor to the bread. National chains are experimenting with new lobster offerings as well. With its recent menu revamp, Red Lobster has created a number of new offerings, including a petite lobster roll, a mini version of the classic sandwich made with Maine lobster meat served in a toasted, buttered roll; and Southwest-Style Tacos: three tacos filled with lobster meat topped with house-made fire-roasted corn, avocado salsa and jalapeno ranch. The chain also offers a popular Lobster and Langostino Pizza, featuring a thin, crispy crust topped with chunks of Maine and langostino lobster, melted mozzarella, fresh tomatoes and sweet basil. The Orlando, Fla.-based chain has more than 700 locations worldwide.